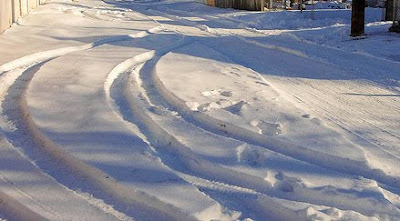 In my past life as a sales trainer, I used to use skid control to illustrate my point about goals. I would ask how many people had experience with winter driving. Most hands went up. I asked how many people have ever lost control. Again, most hands went up. I asked how many people have ever been taught skid control. A few hands would go up. I would take people along with me visually as we were driving in the winter. We were driving along and then... we lose control. We're in a skid. Out of control. Careening toward a snowbank or tree or pole or whatever struck my mood that day. What do you do? What are you supposed to do? You're supposed to look where you want to go. Not at the snowbank or tree or pole you're rushing toward. Obviously you want to be aware those are there, but you don't want to focus on them. Look where you want to go and your body will adjust itself and get you there. This is a perfect metaphor because if you keep focused on your goal(s) your mind will adjust itself and get you there. Now, why am I bringing this up? Well, years of using this metaphor in class paid off last night. I was driving to my Photoshop course along a fairly main - yet unplowed - road. I was only going about 30-35km/hr because of the state of the road. The road curved. I was following the tracks all the other cars had made. I was just thinking in my head, "I hate being the lead car! So much pressure not to lead everyone into the ditch..." Then... the tracks lead me right to the edge of the pavement. My tire caught and I was out of control. The car turned toward on coming traffic. I steered and overcorrected slightly and was suddenly off the road. Staring me in the face was a telephone pole. I was going right for it. Then my words came back to me. "Look where you want to go." I stopped thinking and looked toward the road. No accelerator. No brake. Then, easy on the accelerator. I didn't stop. I would have been stuck if I did. I saw the cars behind had slowed right down and I had plenty of room to get back on the road. And that's what happened. I got back on the road. (Thank goodness for courteous drivers.) I continued on my way to class. Believe it or not I was calm the whole time! All in all, last night was a pretty good night. It could have been a hell of a lot worse. Our big boy was so proud! A sign that we really need to go outside more!